These tips are provided for use at your own risk and discretion. These tips have come from other Explorer and Ranger owners who would like to share the information they have gathered. If you would like to contribute tech articles, installations, conversions, etc. Please join our MESSAGE BOARD. Many Explorer/Navajo owners have went with synthetic transmission fluid hoping to extend the life of the transmission. I use Mobil 1 Synthetic fluid. Synthetic fluid handles high temperatures and pressures better then conventional fluids. Another preventive maintenance tip is to replace the rubber plugs in the shift rail bores with steel freeze plugs. The rubber plugs have a tendency to dry up and leak, and/or fall out. 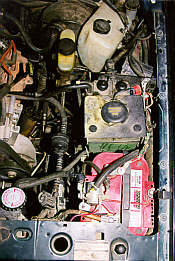 The plugs are located in the transmission top cover and face towards the rear of the truck. The part numbers for the metal plugs are: Dana #219-3052 or Dorman #555-108, you will need 3 plugs to do the job. The hydraulic clutch, slave cylinder/throwout bearing is another item you should pay close attention to. After time, the slave cylinder fails to release the clutch completely. 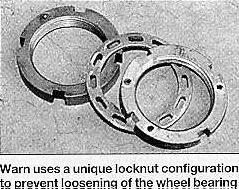 If you are having trouble shifting into 1st and reverse while stationary or if your truck creeps forward with the clutch pedal depressed the slave cylinder/throwout bearing is probably at fault. Unfortunately there is no easy fix here as the transmission must be removed to replace the combination slave cylinder and throwout bearing. I have found that when running large tires on the Explorer a severe jolt to the wheel can cause the outer spindle locknut to come loose, causing excessive play in the wheel bearing (loss of preload). In the stock configuration, the inner spindle nut has a pin which engages a keyed washer. The keyed washer keeps the inner nut from turning but there is nothing to keep the outer nut from breaking loose except the torque that is applied to it. Warn now has a solution to this problem. Warn part #37207* (conversion kit) replaces the stock keyed washer with a new washer which incorporates slots instead of holes for locking purposes. The new outer locknut has been drilled for three small allen screws. These screws when tightened will engage one or more of the slots in the washer. Combined with the stock pinned inner locknut this makes for a nearly bullet proof set up. I have yet to experience a problem with the new locknuts. *Warn has discontinued part #37207. The only way to get the required parts is to make them yourself. There has been a lot of discussion as to which chip is best for the Explorer. I only have experience with the Hypertech chip. After installing the Hypertech module in the computers service port bay I noticed that the engine would pull harder in the mid-range and top-end. The engine is now able to turn at least 500rpm more than stock (stock 4200rpm, modified 4700rpm) as indicated by the factory tachometer. This is definitely a plus when you need the extra top end. The Hyper tech chip also disables the stock speed limiter which kicks in at about 95 or so. I haven't noticed any change in fuel economy at all. The biggest improvement for my vehicle, was that it eliminated the pinging I was getting at freeway speeds on 105deg and hotter days in Phoenix. The pinging has been completely eliminated and I still run regular unleaded. Anyone using a ham radio or C.B. in their Explorer has most likely heard the effects of RFI. The interference sounds like a high ambient noise level and the receiver possibly shows many S-units of signal strength even when there is no one transmitting. The in-tank mounted electric fuel pump is the source of this problem. Fortunately Ford has a fix for this problem which is covered under the original warranty. If the truck is out of warranty you can get the parts and do the job yourself or have it performed at a shop. The Service Bulletin that covers this problem is # 9117-5. The part you need is a Filter Kit, Ford Part # E7PZ9B357A. Although the addition of the filter did cure about 90% of the problem some interference is still noticeable on a few of the Ham Radio bands. Even so, it sure sounds much better then before the fix. I have a 2001 Sport Trac and TSB # 01-07-03 is for installation of a noise suppressor in the fuel tank, Part # F1PZ 18B925 A. Where in the heck did you find the room to mount a second battery? I removed the stock windshield washer/coolant tank and cut the tank apart between the two separate compartments. I discarded the washer fluid tank and kept the coolant tank. I then mounted the coolant tank to the Explorers fuel tank vent, which has two round plastic caps on top of it. The coolant tank is now attached to the vent housing with a piece of perforated metal strapping. With the coolant tank relocated, there is plenty of room for a second Optima battery. I mounted a steel battery tray to the inner fender using a block of wood as a spacer to hold the tray level. The wood is bolted to the metal ledge and the tray is attached to the wood block. I replaced the stock washer fluid tank with the smallest tank I could find at a junkyard (I think it was out of an old Dodge). I mounted it next to the master cylinder, towards the fender. The second battery is charged using a continuous duty solenoid as the isolation device. With the three position switch mounted on the dash I can charge both batteries, isolate the auxiliary battery, or jump start myself. Many Explorer owners have experienced "bogging" or "missing" or just unsteady performance in their 4.0 engine and have been frustrated by lots of expensive "non-fixes". After riding on a plane next to a manufacturing trainer from a company that builds OEM replacement auto electrical components for places like AutoZone and CarQuest, I tried his tip. He says that Ford have these problems more than other makes and the 4.0 engine seems to be more susceptible to the problem than other Ford engines. It seems that a "missing" engine culprit is actually the computer's sensor inside the Mass Air Flow Sensor (MAF). It eventually just gets a little dirty or builds up its own patina in the filament wires. A dirty or slightly patinaed filament will send the wrong air reading to the computer, saying it is getting more air than it really is and the computer will tell the EFI to send in the wrong mix of fuel, thus, the bogging. The patina seems to form faster if you live in a damp climate. I don't so here in New Mexico mine went 82K before it developed a small "flat idle spot"Â…it would run just fine but the idle began to drop every few revs from 700 to 500. No big deal. When your engine is cool, remove the wiring clip from the side of the black plastic sensor part of the MAF aluminum body. To remove the MAF interior sensor wire, you will need a Security Star (Size T15 or T20) screwdriver or screwdriver bit for a power screwdriver. Remove the two security star-head screws and carefully remove the sensor. You will see the two sensor filamentsÂ…they look almost like the filaments on a light bulb. Carefully spray the filaments with an O2 safe carburetor cleaner, such as Gumout. Let it dry thoroughly. I help mine along with a careful blast or two of canned dry air. While it is drying carefully wipe the aluminum mount surface of the MAF body if there is any dust there, but be careful not to get dust in the mount hole. When the sensor is dry, replace the sensor back in the MAF body and secure with the security star-head screws. These don't need to be torqued down, just simply hand tight. Replace the wiring clip. Then start up your engine. You should have solved any bogging or missing problems. My flat idle spot is ancient history.